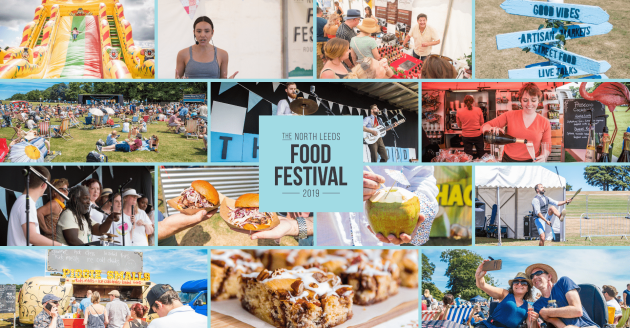 The North Leeds Food Festival is returning to Roundhay Park on June 22nd-23rd, 2019. We’re back with more mouth-watering International Cuisines, Street Food, Fine Artisan Produce, Superb Live Music & Live Entertainment. And new for 2019, we have a full Chef’s Demo stage, showcasing the region’s top chefs! Fancy something sweet? Pick up Spanish Churros, smothered in Belgian Chocolate. Choose food from Japan, Italy, Peru, The U.S, or anywhere between! With over 31 different cuisines to choose from, you’ll be coming back for more. Live Chef Demo’s – New for 2019, we’ll be hosting a full Live Chef’s demo area. Take a seat and watch the region’s best chefs cook up a storm. Want something non-alcoholic? No problem, we have a specialist bar squeezing Juices and Smoothies on the spot for you. Want something for later? We have everything from handmade Marshmallows, to Independent Wines and Gins. Specially assembled for the festival, you can take your pick from the finest artisan brands in the UK. Limited Discounted Early Bird tickets are available from just £4.98 per adult. Offer ends soon! Wellbeing – Walk through the dedicated Wellbeing area at the festival this year. Here you will find everything from Independent Cosmetics, to Yoga Talks or healthy living interactions. Full Live Music & Chef Demo line up to be announced. Limited Discounted Early Bird tickets: Available from just £4.98 per adult.